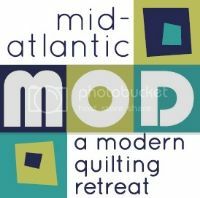 Mid-Atlantic Mod Retreat 2016 is less than 3 months away! Can you believe it? Keep on reading if you're interested in participating in swaps for the retreat! You make take part whether or not you signed up during registration. If you want to do Swap #2 (Secret Sewist Swap) you must fill out the Google Form by Feb 20th (do it before QuiltCon if you are going). Just like last year, we will have two different swaps at MOD. You can take part in one, both, none at all, but I can assure you that they are both going to be fantastic! 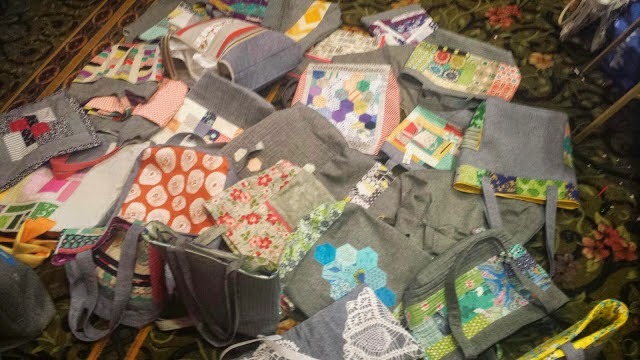 Last year, we swapped mini quilts with a general modern theme (above), and the year before, we swapped tote bags using Essex Linen from Robert Kaufman! There are no official signups for this swap - just bring it to the retreat and you'll come home with one! The exchange is random so you are not making the mini for anyone specific. We may do a fun activity to swap (like the White Elephant swap from last year). It must have a RAINBOW THEME - whether you use a rainbow of colored fabrics, a rainbow somewhere in the mini quilt, binding that evokes a rainbow... it's up to you! The whole mini does NOT have to be a rainbow, though. Use your imagination! Get creative! Make something you would LOVE to keep yourself - then you know someone else will love it, too. Use your own fabric to make this swap item. It must have a label on the back so your recipient can find you and thank you! It can say something as simple as "Made by (your name)", and if you want, you can commemorate the event ("Mid-Atlantic Mod Swap 2016"). 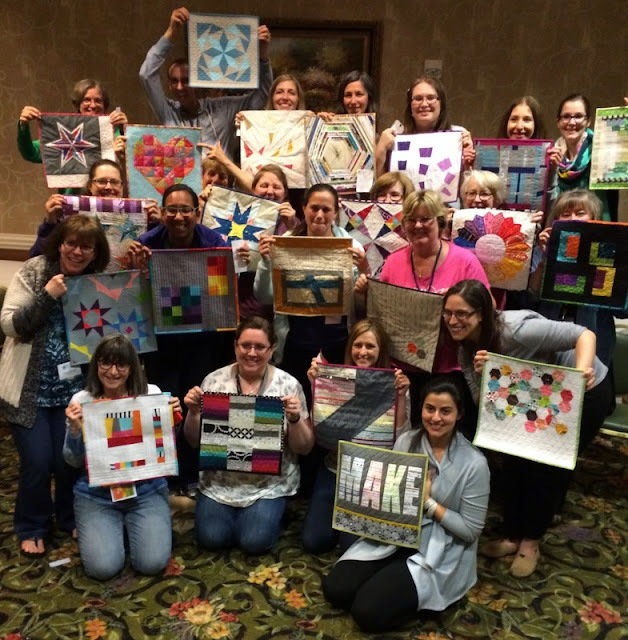 You can make anything you want with a rainbow theme, but please keep in mind that this is a modern quilting retreat. For example, no appliqued baskets of flowers, lace applique, Sunbonnet Sue, etc. Some ideas for you: using solid, bold fabrics, improvisation, a modern block surrounded by strips, several blocks pieced together in modern fabric, low volume fabrics as a background, etc. You might want to make something functional that your recipient can hang in their house/sewing area. Please bring the quilt wrapped or in a paper bag so it is not visible and without your name on the outside. You can post pictures of your mini on Instagram/Facebook/your blog before the swap (tag them with #midatlanticmod), but if you do, try not to show people how yours is wrapped so everyone is surprised when opening them. Click here to see a Pinterest board with Rainbow mini quilt inspiration. We had so much fun with this swap last year that we decided to do it again! You can only participate if you will be there Friday, Saturday and Sunday. You're not required to leave a gift on Thursday, but feel free if you're both there. Click here to see a Pinterest board full of Secret Sewist inspiration. Also check out the #midatlanticmod hashtag on Instagram to see gifts from last year's retreat! Get ready for an awesome, swap-filled retreat! All of them are filled with amazing talent and I think all of them did an amazing job with their work. They sure know how to make simple and cute designs. Keep us updated.